Discover if Almond oil is effective for dark circles under your eyes! Beautiful eyes make you look adorable. For this reason, you should always ensure that the skin around your eyes is radiant and healthy. However, because of the hectic lifestyles and pollutants in the environment, we often find ourselves with the dark circles under our eyes. The dark circles under our eyes will not only make you look tired but also unattractive. While the eye surgery is great options to correct the condition, they are quite expensive. On the other hand, we have creams that claim to help with the condition but contains harsh materials that will affect you in the future. This is why it is important to take advantage of the natural products that are not only safe, inexpensive but also readily available. One of the best under eye dark remover is the almond oil. The almond oil contains nourishing vitamins that help in treating skin conditions including the undesirable dark circles under the eyes. This oil works by reducing the dullness and lightening the skin, making it an effective natural remedy. If you are a constant reader of health magazines or blogs, you probably know that almond oil does a great job in boosting the health of both your hair and skin. Although you can reap many benefits by consuming the almond oil, you will need to apply it topically to get rid of the dark circle. The oil is a rich source of nutrients that are great for treating your skin. You can easily apply it on your face if you would want a youthful and smooth skin. The best thing about this oil is that you can also ingest it internally to reap the benefits. Besides being used in boosting the health of your skin, this product is also used as medicinal oil especially in the Unani medicine system. The oil is harvested from natural almonds making it completely safe. The almond plant is native in Spain, Middle East Mediterranean and is not commonly grown throughout the US. Because of its diversity in the growing region, each of the models growing in different parts of the world has its own taste. This is why it is classified into two main types. We have the bitter almonds, which are considered unsafe as it contains hydrogen cyanide, which is poisonous. In the countries where the bitter almonds grow, the products from this plant are first processed before being released to the market. This ensures the users get to use products that are a hundred percent safe. The second type of the almond oil is extracted from sweet almonds. Sweet almonds are usually the variety that you can find in stores being sold as fruits. Although these fruits are generally known as sweet, they have a slightly different taste depending on the regions where that are harvested. The type of oil that you harvest for your black circles will depend on your priority. The only thing that you have to note is that bitter almond oil has undergone through additional processing to make it safe. The best thing about this oil is that it works to decrease the appearance of the dark circles under eyes. However, if you would want long-term benefits you would want to use it for at least six weeks. The rule of the thumb is that the longer you apply the oil the better the chances of the ski layer to regenerate. How Does the Almond Oil Works on Face? As mentioned earlier, almond oil has various therapeutic properties that are effective in treating the under eye dark circle. Below are some of the ways that the oil will work to boost the health of your skin. Combining sweet almond oil and aloe gel will give you a cooling mix that offers impressive results. To come up with this mix you simply need to mix them at a ratio of 1:1. This simply means one teaspoon of aloe gel and one teaspoon of almond oil. To apply it you simply need to dab it as a moisturizer before going to bed. You can also use it as a primer before applying makeup. Milk contains lactic acid, which is very similar to the ascorbic acid in lemon juice. It also comes with useful proteins, which helps in boosting the health of your skin. Combine almond oil with powdered milk to make a nourishing mask for the area under your eyes. To apply it, spread it on the area or the whole face and leave it for 15-20 minutes before rinsing it with cool water. As you probably know, honey comes with legendary healing properties. To make this mixture you simply need to mix two parts of honey with one part of the almond oil. Use this blend as a nourishing mask. For the best results, you need to apply it to your whole face and leave it for 10-20 minutes before showering. Turmeric boasts of powerful anti-inflammatory properties. This makes it a great remedy for treating the puffy and swollen eyes. You simply need to add a pinch of turmeric powder in the almond oil. Apply the mixture liberally on the area and place a warm and damp cloth over the eyes. This will ensure the turmeric doesn’t stain your skin. Leave it for 10-15 minutes before rinsing off with cool water. Lemon juice is a rich source of vitamin C. This vitamin is very useful in lightening as well as evening your skin tone. Combine three parts of almond oil with one part of lemon juice and apply it to your eye area before going to bed. Combine almond oil with extra virgin oil or coconut oil in a ratio of 50/50. This helps you to come up with a super rich nourishing cream for your eyes. Apply it before bedtime. Adding about 3-4 drops of almond oil in a slice of an avocado can help perk the skin around your eyes. After adding the drops of almond oil, mash the avocado to make a paste. Apply the paste to the area under your eyes and leave it for some minutes before rinsing it off with cool water. The avocado will add its unique blend of useful vitamins including vitamin K, vitamin E, and vitamin B. your skin will also get a healthy dose of essential fatty acids. This is a perfect blend of individuals who have puffy eyes. To make this mix, add one part of castor oil and one part of the sweet almond oil and use it as an overnight cream for your eyes. The blend combines essential fatty acids and ricinoleic acids that act as potent anti-inflammatory agents that does a great job in reducing the swelling. Jasmine essential oils will help relax your tired eyes. By combining a tablespoon of almond oil with a drop of jasmine essential oil, you will get an invigorating blend that clears the dark circles immediately. Apply a generous amount of this blend on the area affected and massage it gently. The key here is to use plenty of oil to avoid damaging the delicate skin. Relax and lie back for about 20-30minutes while ensuring that you have a warm compress over your eyes. Rinse off your eyes with cool water and you will feel refreshed. We have some individuals who are allergic to nutty ingredients. For this reason, you should always perform a patch test to ensure that you are not allergic. If you are allergic, you should go for other alternative dark circle natural remedies. As you can see, there are various ways that you can use the almond oil to get rid of the dark under eye circles. While all the above ways can help you do so, experimenting with each one of them will allow you to find the one that works best for you. Prevention has always been better than cure. 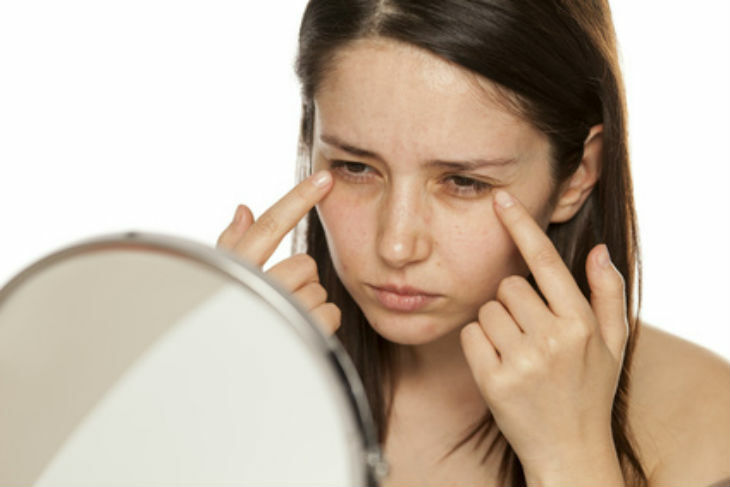 Below are some useful tips that can help you from getting the dark under eye circles at first. if you do not know, sufficient sleep is crucial for the health of your skin. By sleeping about 6 to 8 hours daily can help you avoid various skin conditions including the dark circles. Lack of balanced diet as well as eating junk food can also do a lot of harm to your skin. This will not only impart the area under your eyes but also the rest of your skin. Ensure you have eaten plenty of vegetables, fruits, healthy fats, and lean meat. Visiting nutritionist can also help you eat a balanced diet, improving your general health. Lack of enough water can also result in dark circles under the eyes. Keeping your body well hydrated will help your skin to instances of dry skin, wrinkles, and fine lines. Doctors advise drinking of about 2 liters of water daily. Remember the dark circles around the eyes are caused when there is inflammation or development of wrinkles. If you can keep these things at bay, you will reduce the chance of the dark circles appearing. The best thing is that there are various home remedies that you can add to your daily skin routine to ensure that you have a healthy skin. Always go for the natural remedy, as they are effective and safe to use. Nobody would want to have dull skin under the eyes or raccoon eyes. This is why it is important to consider using the almond oil. As you can see from the above list, there are various ways and combinations that you can use the oil. Regardless of the method you use, you will benefit from the healing properties of the almond oil helping you keep the unsightly dark circles around your eyes at bay finally. By trying various remedies we have listed here, it will be easier for you to find a remedy that works best. All the best!